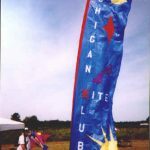 The Mid-Michigan Kite Club held its first annual kite festival on Saturday, April 10, 1999 in celebration of the “April – Kite Month” observations. Held at Flint’s Broome Park, 250 kiters turned out to put their toys in the sky. Many did not even know they were kiters till they showed up to see all the kites in the air and were handed a kite to fly. Other, more avid kiters, showed up from across the state with their favorite toys to share with others. License plates from Oregon and New Jersey were seen in the parking area, because this was the place to fly if you were in Michigan on Saturday. 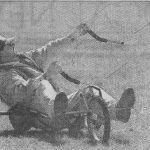 Many kiters from the Mid-Michigan String Stretchers that share “dual-citizenship” in both clubs drove the 100+ miles to buggy and do battle with fighter kites. 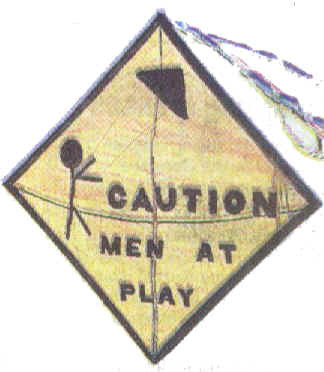 Flint’s Mayor Woodrow Stanley was on hand to fly kites and pursue his re-election campaign with three television stations reporting and the local newspaper “misreporting” certain details. 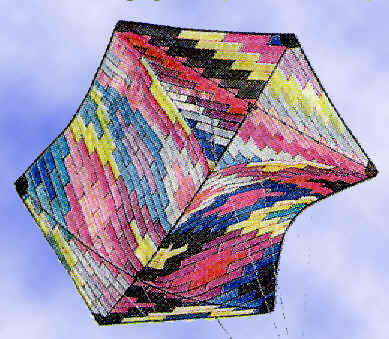 Tom Marschick was reported to have flown his “312-pound kite” that he made from scraps. 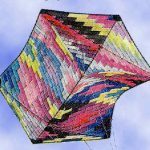 Tom is a great kiter, but his kitemaking skills are admired because he made a 312 PANEL Rokkaku from scraps. It is actually a whole lot lighter than the Flint Journal reported. 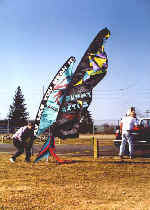 SkyBurner Kites and Progressive Line kites were both in attendance with John Davis and Jon Trennepohl representing them. Jon brought some of Goodwinds Kites’ POP KANs to try and buy. 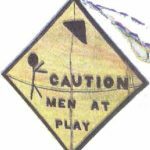 Several fans of the Cube Kites were quickly hooked. Others got a chance to fly the NASA Para Wing that was built by Peter de Jong, They walked away with their arms a little longer than when they started. 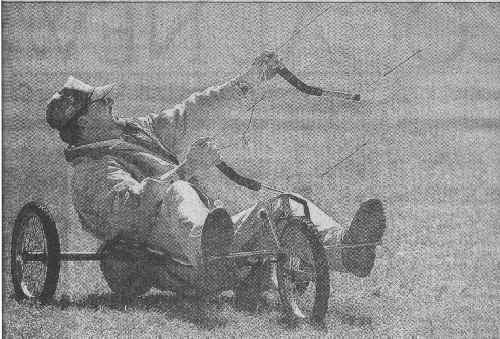 Club president Nels Olsen III was seen being dragged around a reasonably dry field in his buggy. Other highlights of the day included some friends and your faithful, if not foolish, correspondent successfully getting MY six foot Rok out of the ONLY tree in the huge flying field. Yes, if there is only one tree, for acres, someone will get a kite tangled in it. And it was a lot of fun having many kiters of various skill levels getting my errant toy untangled from the tree. The club got many of the neighborhood kids and parents involved by handing out “el-cheapo” plastic keeled delta kites to all kids that showed up. A public address system played a wide variety of music for demo flying by several talented dual line kiters. Quad liners were also represented by the club “new-kid” Brian White. Brian can make a sled kite from fast food bags quicker than you can eat the donuts out of his favorite “bakery sacks”. 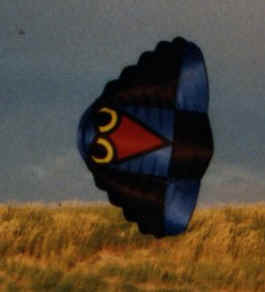 Jim Imperi kept things moving with a variety of kites in the air, while Randy Johnson and Al Shurkey flew pairs. 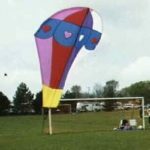 The Mid-Michigan Kite Club has several meetings and “club fly” events all year long, but this was the first event aimed at the general public. Broome Park has soccer fields, baseball diamonds and several acres of flat land to accommodate hundreds of kites. This is an ideal area for flying. 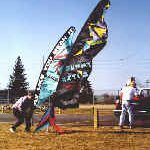 The club set up a demo field and single line area to give best terrain to all forms of kites. Several days of rain the week preceding the event had organizers anxious about how the Michigan weather would be. The worries were wiped away by steady, reliable winds and sunny skies. Plans for a “port-a-john” never did quite come together. Next year, the club WILL NOT depend on the Flint Parks Board for that necessity. The real joy of the event was getting together with all the long time kiters that showed up to fly with the neighborhood kids. 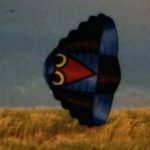 A 20 year old Cody Box kite was brought out of storage to show some of the things that have been flown in the city’s parks over the last 2 decades. People that haven’t flown in months or years brought out their favorites and got tangled, tanned and tired by the end of the day. This entry was posted in Events / Festivals, Issue 9 (May/Jun), Reports and tagged Michigan.